Three Chinese American women reveal the westernization of the traditional Chinese diet in America and Asia, its implications, and the importance of cultural competence when helping Chinese American clients improve their eating patterns. From chicken chow mein to acupuncture, Chinese food and culture have an unmistakable presence in the lives of Americans across the United States. Chefs such as Martin Yan have brought Chinese cooking to the average American household, while books such as The China Study have raised public awareness about the health benefits of the plant-based diets consumed in rural China. In this article, three Chinese American women explore the evolution of Chinese food in the United States, Chinese American nutrition issues, and cultural competence strategies. Sherry Lam writes about Chinese food from her perspective as the daughter of a Chinese restaurant owner. Amy Lee explores the nutrition transition occurring simultaneously in Chinese communities in China and the United States. Lastly, Melissa Ip, MA, RD, discusses strategies that dietitians can use to offer culturally competent care to Chinese American clients. A Chinese restaurant can sometimes seem as nightmarish to a dietitian as a fast-food joint. It never occurred to me as a first-generation Chinese American raised in San Francisco that Chinese food could be considered unhealthful until I began my nutrition studies. I was surprised and disappointed to learn that the cuisine I grew up eating was often placed in the same category as fast food. But as I began to unravel the mystery behind this particular cuisine, I found significant differences in the types of dishes prepared for various populations. My father has been the head chef of Chinese restaurants and a great cook at home my whole life, so I understand firsthand the variety of ingredients and cooking methods used and the seemingly endless array of dishes that are part of Chinese cuisine. The meals my father prepared at our restaurant for a primarily Caucasian population in suburban Sonoma County, Calif., consisted mainly of what many people think of as Chinese food: fried rice, chow mein noodles, egg rolls, and sweet and sour pork. These foods are quite different from the dishes he prepared in San Francisco for his Chinese customers, meals that included a larger variety of vegetables and fresh meats. In comparison, his cooking at home resembles traditional Chinese cooking with fresh ingredients and less sodium and oil. The traditional Chinese dishes and cooking methods used are far different from the stir-fried and deep-fried items that may come to many Americans’ minds when they see a Chinese takeout box. When my family discusses food, we talk about how fresh the vegetables and meats are and the best ways to cook them to maintain that freshness and quality. Cooking methods include stir-frying with less oil, steaming, poaching, and boiling; deep-frying is a less-common cooking method. With steaming and stir-frying, few nutrients are lost in the cooking process. Chinese soups, which consist of various meats, bones, vegetables, beans, and Chinese herbs, are also common in many households. Lower in fat than cream-based soups, these soups take several hours to make, and the Chinese believe they can help achieve a healthful balance through their specific mix of colors, flavors, textures, and types of ingredients. Fruits and sweet beans—such as green beans (known in the United States as mung beans), often consumed as a sweetened soup—are commonly served after dinner in place of desserts. Additionally, there are a number of benefits to eating family style, which is the norm among many Chinese families. Besides providing a time to socialize with family, eating in this manner may help children and adults to be more in tune with their own satiety cues and learn good eating habits. So it is interesting to see what Chinese food has become in America. In The Fortune Cookie Chronicles, Jennifer 8. Lee states there are more than 40,000 Chinese restaurants in the United States—comparable with the number of corporate fast-food restaurants. As the Chinese American population grows into its second and third generation, the meals served at home will likely include more “American” ingredients and cooking styles, while traditional cooking methods will be gradually lost. When my father cooks for a non-Asian group, he naturally creates dishes that are more calorically dense, higher in salt and sugar, and unhealthful overall simply because he believes that is what people desire and that traditional Chinese meals may be unpalatable to many. More frozen and easy-to-prepare “Chinese,” “Asian,” or “Oriental” meals are lining the shelves of many supermarkets, further reinforcing a narrow view of what Chinese cuisine is. Even though Chinese food can be very healthful, as globalization changes the food and agricultural landscape while simultaneously moving people around the world, adults and children in both China and Chinese American communities are experiencing a nutrition transition. According to an article in the November 2004 issue of the International Journal of Obesity, “The Nutrition Transition: Worldwide Obesity Dynamics and Their Determinants,” nutrition transition is described as large shifts in diet and physical activity patterns, usually preceded by or occurring simultaneously with two historical processes: the demographic transition from high fertility and mortality to low fertility and mortality, and the epidemiological transition from a high prevalence of infectious diseases to a high prevalence of chronic and degenerative diseases. Since the 1980s, the nutrition transition in China has been rapidly occurring as the political and economic climates evolve. What is significant in China is the buying power enjoyed by children as the result of the one-child policy instituted in 1978, whereby the only child is constantly lavished with care by his or her parents and grandparents. Feeding China’s Little Emperors, a collection of papers compiled by anthropologist Jun Jing, explores the dietary patterns of children growing up in the post-Mao transition to a market economy, where children dictated up to 70% of a family’s spending. For the first time in Chinese history, children were able to express preferences for different foods instead of merely accepting what was presented to them on the dining table. Food companies in China and abroad started to target both youths and the financially secure parents who wanted to give their children the best. Many children in wealthy urban areas developed preferences for fast foods and processed foods instead of the traditional Chinese cuisine, leading to an increased prevalence of childhood obesity. Shifting the stage to the United States, dietitians working with Chinese American clients find that the degree of acculturation affects Chinese Americans’ dietary behaviors. Jing Liu, MS, RD, a dietitian at Asian Health Services in Oakland, Calif., says that “recent immigrants tend to have a consistent meal schedule, inconsistent snacks, [and] eat more grains, fish, fruits, and vegetables and less red meat.” By contrast, second- and third-generation Chinese Americans follow a less-consistent meal schedule and consume relatively greater quantities of snack foods and red meat than grains, fish, fruits, and vegetables. Dietitians are witnessing a growing prevalence of overweight and obesity among Chinese American adults and children due to changes in dietary and physical activity patterns. “Many of the recent immigrants experience weight gain within the first year they immigrated to the States,” says Hazel Ng, RD, a private practice dietitian in California’s San Gabriel Valley and creator of SmartEater.net. Deborah Ting, RD, CDE, a dietitian at the Indian Health Center of Santa Clara Valley in California, observes that low-income Chinese immigrants tend to adopt less-healthful dietary behaviors early because of limited resources and misinformation. For example, lower-income Chinese immigrant mothers who utilize Women, Infants, and Children services are more inclined to choose infant formula over breast-feeding because “[t]hey want their children to gain more weight and grow taller like the Caucasian Americans,” Ting observes. Busy work schedules also mean that low-income Chinese parents quickly become accustomed to eating at the more inexpensive American food establishments. As Chinese people in Asia are experiencing a nutrition transition, lifestyle and dietary changes are similarly observed in Chinese American communities. Therefore, an awareness of the differences in socioeconomic and cultural backgrounds of patients can strengthen dietitians’ ability to offer nutrition education and counseling most effectively. Cultural competence requires that dietitians be cognizant of the dietary practices and health beliefs of diverse groups, including ethnic and racial minority groups. Health professionals are increasingly identifying cultural competency as a strategy for addressing racial and ethnic disparities in health and healthcare.1 Chinese Americans, among other Asian Americans, are not exempt from health disparities. Asian Americans are at higher risk of osteoporosis, hepatitis B, diabetes, and some cancers. Given that health disparities often pertain to nutrition-related chronic diseases such as heart disease and diabetes, dietitians play a vital role in addressing these disparities through culturally appropriate nutrition education and counseling. A critical strategy for providing culturally appropriate nutrition education is speaking the same language as the patient. “Speaking to first-generation Chinese patients in their own native language is useful because they can open up more about their daily habits,” suggests Ting. “If one is unable to speak the language, having an interpreter is helpful because Chinese patients who have language barriers are usually very agreeable and will not express their health concerns.” Dietitians should make full use of translation services when communicating with Chinese clients with limited English proficiency and utilize existing Chinese language nutrition education resources. Even though most Chinese immigrants represented in the United States are from the coastal regions of China, speaking mostly Mandarin and Cantonese dialects, Chinese communities are characterized by great cultural and linguistic diversity, with more than 50 minority ethnic groups and numerous dialects, often not mutually intelligible. Chinese families also follow different dietary practices depending on their region of origin. “For example, Chinese people from the southern part of China mostly eat a Cantonese cuisine, which includes steamed rice with few meat and vegetable dishes,” says Simon Sum, MS, MPhil, RD, ACSM-CPT, a clinical dietitian at Alhambra Hospital Medical Center in Los Angeles. “People from the Szechuan and Chongqing area mostly consume a diet with a lot of spicy food made with chili oil and paste.” Culturally competent dietitians are those who recognize differences in health beliefs, dietary preferences, and practices within as well as across countries and cultures. Cultural food traditions have evolved over time with changes in agricultural systems, food processing techniques, and global migration patterns. The U.S. population, comprised of immigrants, continues to experience significant demographic changes, with the Asian American population becoming the fastest-growing ethnic group, of which 23% identify as Chinese, according to the 2000 Asian American Federation census. 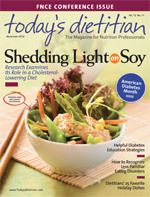 The American Dietetic Association Professional Code of Ethics demands that the “dietetic practitioner [provide] professional services … with respect for the unique needs and values of individuals.” By better understanding diverse food practices and the food environment in the communities that they serve, dietitians can better equip themselves to cater to the unique needs and values of their clients. — Sherry Lam is a master’s degree candidate in nutrition education and Amy Lee is a master’s degree candidate in nutrition and public health at Teachers College, Columbia University. Melissa Ip, MA, RD, is a health educator in New York City’s Chinatown. • Hsu WC, Yoon HH. Building cultural competency for improved diabetes care: Asian Americans and diabetes. J Fam Prac. 2007;56(9 Suppl Building):S15-S21. 1. Betancourt JR, Green AR, Carrillo JE, Ananeh-Firempong O 2nd. Defining cultural competence: A practical framework for addressing racial/ethnic disparities in health and health care. Public Health Rep. 2003;118(4):293-302.